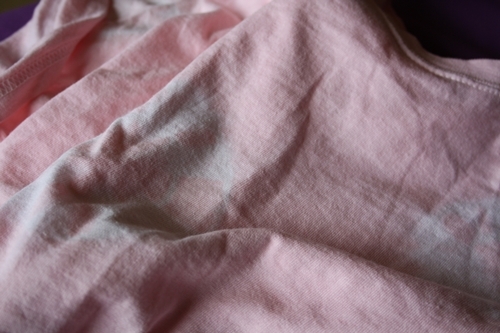 I jumped on the current blogging bandwagon and had a go at some DIY dying. 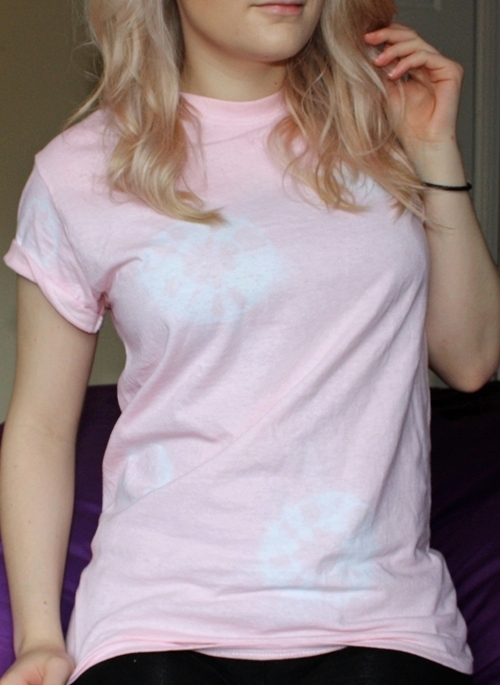 I'm a DIY clothes freak and I'm glad I did this - I'm so pleased with the results! I was also extremely keen to give the ombre jumper look a shot, as I love this one in Topshop, but can't justify spending £45 on a jumper. I saw Lucy from Lucy Boots was making similar jumpers (she's making and selling them by the way!) so it gave me some courage to get DIY dying. I thought I might as well try out other dying techniques too, as one packet of dye goes a long way! 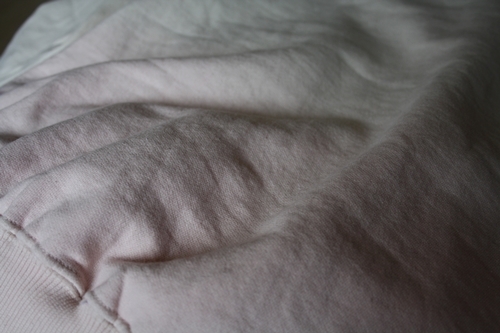 I ordered some Dylon Powder Pink dye, a plain white t-shirt, a beige jumper (the first one I ordered was too small... you'll see what happened to that) and another (larger!) 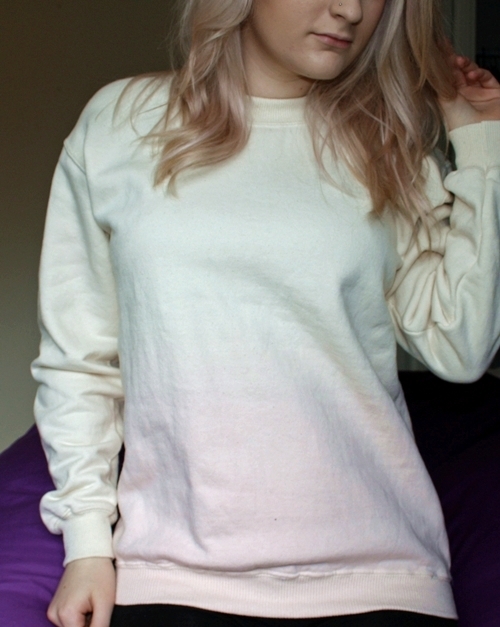 beige jumper. First off, I gave tie dying a go as I'm most familiar with it - it took me back to year 7 art lessons! I just tied bits of the material up with string using this Dylon dying guide. I followed the instructions on the back of the dye and mixed it up - easy as pie. Then I chucked the tee in (damp so I could control the colour better), stirred it for a while until it was the colour I wanted then again followed the instructions on the packet. Then I gave the marble dying technique a shot, as explained on the Dylon guide. It's quite a pale, subtle effect but I do quite like it. This was made from a jumper that I cut up as it was too small for me! I left this one in for about 15 minutes. But my favourite DIY piece I made was the Topshop jumper replica. Minus the studs and the neckline, it's really similar. I got the original jumper here on ebay for anyone that's interested. I dipped half of it into the dye, but then focused on the bottom third, making sure to keep the very bottom of the jumper always submerged. It came out just how I wanted it! I think the key thing was putting the jumper in whilst damp, as controlling the level of colour is tricky! This cost me under a tenner to make! Link me to your DIY posts (I love them!) and let me know what you think! I've been meaning to do this for soo long! And do some studding, but I always forget/get lazy haha. Love this, the topshop one is ridiculously priced! Great DIY! I love the topshop style jumper you've done, I really want one! Definitely gonna have to try this myself! They turned out really great! Congrats! :) The Topshop one is way overpriced for what it is! I saw the Topshop one this morning and thought it was waaay too expensive for what it was! This is such a gorgeous alternative :) I might have to try myself!